We launched this campaign on July 4th, and it is literally a miracle how far we have come in such little time. Many of the most prominent conservatives in the entire state have gotten involved, people all over the district are buzzing about how well we are doing, and we won the most recent online poll. But we are rapidly outgrowing our limited resources. Earlier today I got some great news over the telephone. We have the opportunity to put up a whole bunch of 4×8 signs in south Idaho, and each of those signs will be seen thousands of times a day. But in order to do that, we have got to print up more 4×8 signs, and they are expensive. And more 4×8 signs are not even on the list of extremely pressing campaign needs that we are currently raising money for. Did you happen to see what happened on Tuesday? Republican candidates got killed all over the nation. It was a major league wake up call, because we are in the midst of a battle for the future of this country, and right now the Democrats have all of the momentum. If the Democrats take back control of both the Senate and the House in 2018, they are going to try to impeach Donald Trump. And even if establishment Republicans remain marginally in control, they may try to remove Trump anyway because many establishment Republicans would jump at the chance to betray our president. The 2018 mid-term elections are a golden opportunity for us to elect pro-Trump candidates all over the nation. There are several dozen running, but we are only going to win if you all get behind us. If pro-Trump candidates don’t win the Republican primaries that will start happening in just a few months, there won’t be anyone good to vote for in November 2018, and the mid-term elections will be lost before they even happen. 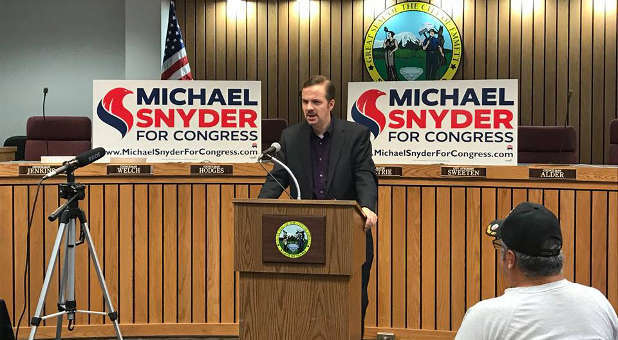 #2 It’s Time To Drain The Swamp – The same rules that apply to the rest of us should also apply to Congress, and Michael will actively fight corruption on every front. This message is resonating with voters wherever we go, and people all over the district are eagerly asking us to hold more campaign events, but in order to do that we have got to have more funding. If you live in Idaho, please let us know that you would like to have a bumper sticker and we’ll get one mailed out to you. And please don’t forget to let us know what you think of the 22 points that we are working on for the next round of brochures. Of course what we need more than anything is prayer. Please pray for me, Meranda, Atarah, everyone else involved in this campaign and for all of our families. This has truly been a grueling process, and the final six months until election day are going to be absolutely crazy. We are going to need more grace and strength than ever before, because it won’t be easy, but with God all things are possible. Next articleWhy Doesn’t The Left Give Our Veterans The Respect That They Deserve?